Back before ebook readers had frontlights we had to carry around a secondary piece of gear just to be able to read whenever there wasn’t sufficient lighting. 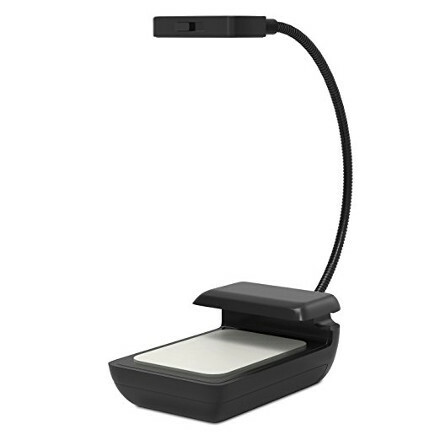 If you had an E Ink ebook reader before frontlights came along there’s a good chance you also had a clip-on reading light as well, or perhaps a cover with a light built in. Clip-on lights still come in handy for ereaders like the $79 Kindle that lack a frontlight, but I’m sure glad not to have to deal with lights anymore. The added weight of the batteries is annoying, not to mention having to pay to replace them all the time. Frontlights are the best thing to happen to E Ink ereaders in the past five years. Released back in 2008, the Sony PRS-700 was the first E Ink ereader to have a built-in light, but it was poorly executed and Sony never tried that again. Frontlights didn’t become popular until 2012 when the Nook Touch with GlowLight was first released. After that everyone started coming out with frontlit ereaders and now only a few non-frontlit models remain. Having a frontlight is nice for when you want to read at night without a lamp, but they also help make the screen background appear lighter and the text easier to read. E Ink is darker than paper so the added light helps improve contrast during the day too. Most people keep the frontlight on all the time. I like frontlights so much that I don’t understand why they still make ebook readers without frontlights. I’m surprised they haven’t been phased out like ereaders without touchscreens. Agreed, front lights are convenient. But…I pulled out my old black kindle basic the other day to read in bed for old times sake. There is something I love about shining a light onto an ereader. It’s almost as if the line between technology and books is just a bit more blurred. I like reading by a lamp and shining light onto what I am reading. Does the front light add extra layers of glass onto the screen? Front light ereaders just seem to have a thicker screen than my old ereader. One thing I love about that basic ereader I have is that the text seems to almost sit on top of the screen and if you turn the e reader to look at the text from an angle you almost expect the ink to be slightly raised above the surface like a real book. The ppi is only 167 but it almost feels like it is easier to read than my 300 ppi Glo HD. Frontlights and capacitive touchscreens do indeed degrade the quality of E Ink screens a little bit because of the added layer over the top. The Kindle Voyage is the only one that has that super clear floating text look like the older non-touch, non-frontlit models. Even the more expensive Oasis lacks that quality. How about Kobo Aura One, how is it lined in comparison with the others? The same as any other typical 300 ppi ereader. Probably hardly distinguishable between the Aura H2O’s 265 ppi screen. I like the convenience of the built-in lights, but I only use them when I’m reading somewhere without sufficient light which is extremely rare. Another reason I prefer my Kobo to my Kindle is that I can actually completely turn off the light on the Kobo, unlike the Kindle. I don’t use front lights very much. I figure that given the limited lifetime of the e-reader battery, I should minimize my use of an e-reader’s battery. I would rather wear out and replace a light bulb than wear out and replace an e-reader’s battery. One reason I returned a Glowlight Plus to B&N was because without the light on, the screen of the Glowlight Plus was darker than the screen of the Simple Touch. I have an old Nook Simple Touch. Only few times (to be precise 2.5) i’ve used the light source similar to that in the title. It was creating a freaking reflection spot… It was really annoying. Now also owning Kobo Aura H2O which I’m really happy about. BUT there is always something better, now i’m craving for Kobo Aura One specifically for a reason of having the option to change the light hue from blueish to yellowish. I find it extremely convenient when you mix it with situations of different kind of ambient light, meaning not only intensity but also a kind of light source. Generally I don’t like the idea of having the embedded light on but i’m travelling a lot and forced into using some extra light especially aboard of airplane and the departure lounge area where it is never enough of the light. I do not consider a front light a feature I care about. Most of my e-book reading is done on my work commute, where there is plenty of sunlight. The one thing that not having a front light does for an e-reader is that it shaves about $20 off the cost of the device. I for one would rather pay $20 less for an e-reader, or stated a different way. This feature is IMHO not worth $20. I bought a basic kindle for $50 last year (no frontlight), very happy with it, and my older PRS-T1 e-reader which I’ve had going six years now (bought it in 2011), also no front light.